I woke up to the sound of glass cracking across the room. The ungodly chill in the room was beyond tolerable. I slid the curtain hoping to see a bright sunny morning, but it was still dark outside and the night sky full of stars. I crawled back into the layers of three razais, a simond alpine jacket, and two layers of woolen socks. 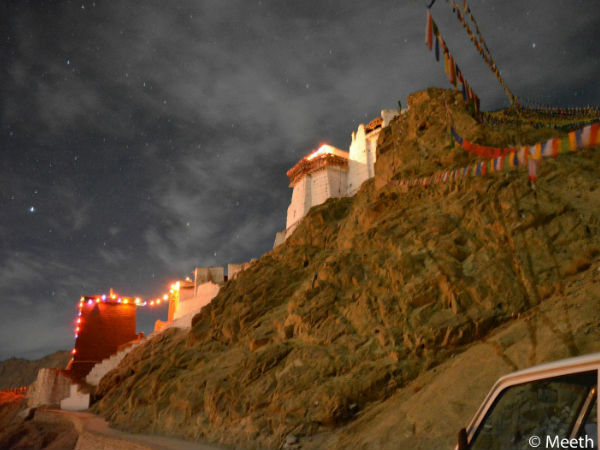 That night in Hunder, a town in Nubra valley, was the coldest of nights, a whopping -18 degrees! My journey to see the trans-Himalayan town of Leh in the harshest of winters started on 24th of December. The first evening in Leh I met an old acquaintance, Zakeer- I had met him in one of my earlier visits. He asked me why I had come in winter. 'Thand dekhne aaya hoon' - A reply that I had memorized to address puzzled faces. And also that it was a brilliant way to ease up to people. There were not too many eateries open. Couple of them kept their door open for late night travelers and gossipmongers. Owned by Punjabi brothers Sharad and Varun Kumar, Neha Snacks right near the Jamia Masjid, boasted a sticker from trip advisor and served hot Chat confectioneries to tourists and locals alike throughout the year. Few eateries did remain open till 7:30-8:00 pm. Tucked away with almost deliberate intentions, a Tibetan restaurant was still open at 8:00 pm. On the suggestion of the owner, I tried an authentic Tibetan dish (Tinmook); hot veg stew with yak cheese and home baked bread. Almost a ritual every evening to burn empty cardboards. After 7:00 pm, shop owners and customers would stand by the make shift fireplace on the streets of main bazaar and teenagers would flirt with each other over the warmth of Kerosene flames. An old fort in Leh- on Tsemo hill. Built by the first inhabitants. (Dardi, the supposed Indo-Aryans). Day 2 : To nowhere particular and Lamayuru. The next day Zakeer and I took the NH-1 route, hoping to see how far we could go and still come back to Leh. This was to be difficult since we would stop wherever we wished and spend as much time as we could. We still hoped to see Lamayuru by the end of journey. It was a long chatty drive. He taught me the Ladakhi translation for asking hot water; 'chu tunmu tung' in case I found myself in a fix. Enroute : Indian national ice hockey team practising on the Leh outskirts and Zakeer with his peace pose. We crossed over a small town called Nimoo, where a lot many people had assembled to congratulate the newly elected MLA. After a break for namkeen chai and Kashmiri roti, we went back to road tripping. We almost gave up on the idea of going back to Leh and instead discussed staying at Zakeer's home in Kargil, the home he had ran away from. But had to give up the idea because I needed to be at two more places and the math wouldn't work out. Realising this, we stopped nowhere and headed straight to Lamayuru. The air outside was freezing over and was well below -13 degrees. Zakeer stepped on the gas and we made it before the sun down. A frozen waterfall resting on the road. Our luck ran out. We reached Lamayuru to find it empty. We could just find one person attending to daily chores. On inquiring, he told us that all monks had gone to Nimoo. Disappointed, I strolled around breathing hard and keeping warm. If there was anything called absolute silence, this was it. The lone caretaker trotted away into obscurity. I sat till the sun down absorbing the moment and then left the place. Zakeer had introduced me to Ali Hussain. Like Zakeer, Ali too had made way for himself in the tourism scene in Leh. He was not as talkative as Zakeer though. He was to take me to Pangong Tso. The Pangong Tso Lake was featured in few scenes of Dil se and Jab tak hai jaan, but was made famous by the more recent 3 idiots movie. Unlike the movie in which the female protagonist reaches the lake from Leh on a mere 100 cc of a moped, in reality there is a gigantic mountain spanning 17586 ft in height called Chang la and such a moped will have to crawl on its knees to reach the lake. ChangLa has its own weather system and can get quite unpredictable. Needless to say we took no chances. Soon we were galloping down the Chang la. Sneaking from between the mountains, the blue lake revealed itself. The valley was windy and for the first time I understood what wind chill meant. The wind felt well below -20 degrees. There was not a single soul around beside Ali and he refused to step out. I trotted alone with my tripod. I struggled with keeping the tripod upright and the cold metal started sticking to my fingers. My fingers started swelling black and blue. I had to alternate keeping one inside the jacket at all times. Pangong Tso : Prayer flags, wind chill and me. Those 20 minutes at -20 degrees felt like eternity. In Tangtse, we stopped to warm ourselves a bit. Nothing short of piping hot Maggi would have done the needful. We pushed back on the road as we saw clouds gathering around Chang La.The snowfall had only begun when we were crossing Chang La and had we not sped up we would have been stuck battling the blizzard. Crossing Chang La was a relief. Through the journey back to Leh we were comfortably silent and spoke only about profound realizations in life. Day 4 : Nubra Valley. Ali and I started early in the morning since we had to cross Khardungla, the highest motor-able road around Leh. There are other 'tops' but they are not open for civilian usage - they lie towards Pangong Tso and China. Enroute Khardungla you get to see a pony track that used to be a part of a major silk route to Kashgar (Xinjiang, Central Asia). Ali had pulled few strings to get an accommodation in a town called Hunder. The temperature was now way below what it had been in Leh and it worried me. We sat comfortably in the kitchen by the bukhari while the ladies prepared meals. This was to be my first proper meal since arriving and it indeed was a prize; Dal makhni, chawal and gobi ki subzi. We dined out with a cup of namkeen chai and said good night. I stayed out late taking pictures of the night sky. It was a wonder how most humanity will go without having to see what I was seeing. The sky was full of stars. All colors. I could see the Milky Way dust stretched across the night sky. Battling extreme temperatures and numbed legs, I pushed myself to take the last photo and then retired for the night. I woke up to the sound of glass cracking across the room. The ungodly chill in the room was beyond tolerable. Having warmed the layers of blankets, I risked tip toeing to check the source of the sound. The glass had cracked. Standing, I felt all heat in my body being sucked out and drained through my feet. For the first time, I wished I were not all alone. 'The only thing worse than being in despair is being in despair alone' I remembered the last lines from Into the Wild. I sprang to the bed and curled up in a fetus like position. I remember talking to myself at some point. I woke up to Rehman calling out to me. It was morning and sunlight poured through the windows. Life seeped through the crack of dawn. Rehman mentioned that the temperature had gone well beyond -20 last night and he was sorry that he had not given me a heater in the room while all of them had slept with bukhari. I said 'bade bade shehro mein aisi choti choti baate hoti rehti hai'. We laughed to the sunshine. There was life all around bustling and waking up with the sun. How could I have held anything against anyone? Left: Posing for selfies with new friends. Right: Bactrian camel. This was Nature. I had come to see how people functioned in such conditions and I did experience exactly that. I befriended two wonderful and very different people, Zakeer and Ali. Both had their share of troubles in life, probably beyond what I can even imagine, but they could still be honest about it and laugh about it. Sharing a laugh and laughing off the troubles was the promise of tomorrow and that's what was keeping all of them safe in this cold desert. Of course there is no denying that namkeen chai and kashmiri roti had their special part to play. Meeth Maharana is an avid traveller, constantly seeking opportunities to escape the mundane life. He currently works as senior analyst for Flipkart and is always found looking for his next break!